In this enthralling installment of what possessions I own, I’ll take you through my suggestions for what I’d consider a very well-packed gym bag. Seeing as how I’ve practically lived out of this bag recently, I think I have it down pat. Since I don’t have a gym membership and I don’t actually go to a traditional gym, this is my “yoga/barre/running on the go/miscellaneous fitness class” bag, but apparently that’s not a category of product yet. 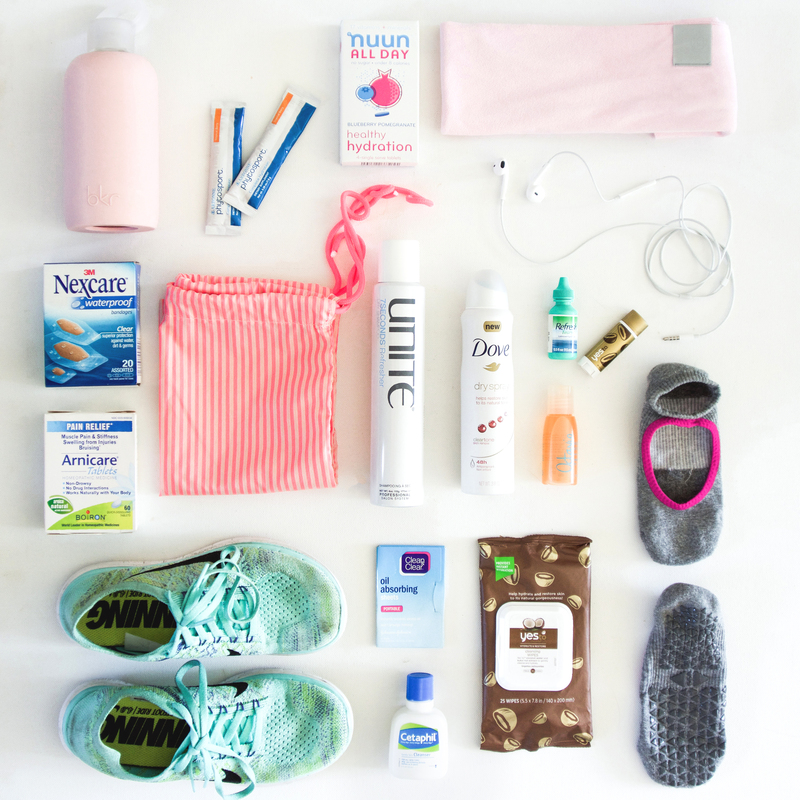 What I’ve got in here are some fitness essentials, “freshening up” items, after-workout shower products, and some things that don’t fit into a cleverly-named category. Let’s get into it. WATER BOTTLE: I know I’m a repeat offender with this one, but I’ve been taking my bkr everywhere. It’s so darn cute. I want all the colors. Aside from my brand allegiance, it’s SO important to have a reusable bottle with you – I’ve taken heated yoga classes without one and nearly fainted (maybe that’s a personal problem, who knows), so I carry this thing with me constantly. ELECTROLYTES: I have Arbonne Phytosport and nuun All Day Healthy Hydration in my bag. For when water doesn’t cut it. TOWEL: This especially comes in handy in hot yoga, when my pores become individual faucets and try to ruin my day/life. I love this soft one from lululemon. BANDAIDS: Because blisters are pretty par for the course. These from Nexcare are waterproof (read: sweat proof) which is especially helpful on feet, which tend to get sweaty during a workout. LAUNDRY BAG: This came standard with my gym bag, but if yours doesn’t, make sure you add one in. Especially if you’re taking your sweaty clothes off… don’t let them mix in with the rest of your stuff/fresh clothes. Barf. DRY SHAMPOO: For a quick hair touch up if you can’t shower. Stuff is powerful. EYE DROPS: I wear contacts – if you have similar problems (blindness) or dry eyes in general, you may share in the plight of irritated eyes while working out. Never hurts to have a little bottle of eye drops in your gym bag. LIP BALM: Lip balm transcends activity/location/time of day. Yes To Coconuts is my fav. HEADPHONES: If I’m heading out for a run somewhere or if for some reason I end up in a gym, these buds are nice to have on hand. HAIR STYLING PRODUCT: This little bottle of argan oil is from this past month’s ipsy box. I use it for a post-shower styling, or if my ends get really frizzy after a workout and I care enough to touch up. ARNICA TABS: Alleviate soreness, or help prevent it from happening. I carry this all the time, especially in my gym bag. LIGHTWEIGHT RUNNING SHOES: These Nike Frees are the definition of lightweight and compact. They easily fit in a gym bag, and are super easy to toss on for a short-distance run or walking around after a class. OIL BLOTTING SHEETS: When your face gets hot, it gets oily. Blot the grease with these sheets. FACE WASH: Even if you’re not going to shower, you should wash your face. Don’t be gross. FACE/BODY WIPES: Another “freshening up” item to clean up your sweaty skin. Big fan of the Yes To Coconuts line if you can’t tell. BARRE SOCKS: Just in case I’m headed to barre or a similar class, it’s nice to have the sticky socks with me. Omg impromptu fitness? I’m so prepared! LMAO YOLO OMG. Extra underwear & socks: Not to be gross, but sweat happens and sometimes you just need to change those layers. Extra hair ties: Because they conveniently break whenever you need them, amirite? Toiletries: For the post-workout shower, most places have shampoo, soap, etc – but I like to have my own in little travel size containers. I’m picky. I also have a toothbrush and toothpaste. SPF: Always a good essential. Protect yo skin! Sandals: for walking back to the car, and for use as shower shoes. Arnica cream: If I’m injured or extra sore, and the tabs aren’t enough, the cream is really nice to have in the bag. Makeup: If I’m going somewhere after class, I’ll shower and put a little makeup on. Extra contacts: because I’m blind and what happens if I lose one or sweat too much and it gets in my eyes ew ok I’m gonna stop now. Sweatshirt or sweater: if I’m especially sweaty from a class but it’s cold outside, I have a sweater of some kind so I don’t freeze. This list is getting long and it’s starting to feel like this is the gym bag equivalent of a clown car. Surprisingly enough, all of this fits comfortably in one bag. Feeling inspired? Have you started packing yet? You’ve got a list, now get your bag (or find one like mine, here and here). Hopefully this will leave you feeling prepared when you leave home for your next fitness endeavor. One more step toward actually working out and getting fit! PS… need a workout playlist? Click here. ALSO listen to the new CHVRCHES album IT’S INSANE. Girl, you got these all covered!!! I love the extra undies recommendation– definitely don’t have those in mine! Dry shampoo is a life saver!